A sailor has abandoned a crowd-funded attempt to break a circumnavigation record after suffering technical problems. 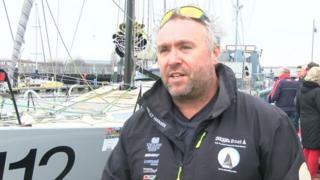 Alex Alley, 48, from Hampshire, was aiming to become only the second mariner to sail solo around the world in a boat of 40ft or less. He left Gosport on Christmas Eve but reported on-board instruments going "haywire" short of the race start line. He made for Brest in France for repairs and said he hoped to resume the voyage. Mr Alley had raised the money by selling 5cm squares on the side of the yacht Pixel Flyer and corresponding pixels on his website. After what he described on his blog as a "perfect sail" down the Channel towards the start line south of The Lizard, he said he noticed his wind sensors were malfunctioning late on Christmas Day. "I rely on all this data for my autopilots to work properly and steer the boat. Without them it doesn't work. Disaster," he wrote. He said he was working to get hold of replacement sensors, but was hampered by businesses being closed for Christmas. Mr Alley said he would need to restart the voyage within a week in order to lessen the chances of hitting storms at Cape Horn. The idea of selling pixels dates back to the Million Dollar Homepage in 2005 which student Alex Tew sold pixels on a webpage to fund his university place. Speaking before embarking, Mr Alley said people had uploaded company logos to fill the "pixels" on the side of the yacht, but also personal messages and family photographs. The current record, set by Chinese sailor Guo Chuan, stands at 137 days, 20 hours 1 minute and 57 seconds.